Home / Celebrities / Sportswomen / Bronze Medalist Karin Oberhofer Shares Her Spectacular Journey To The Olympics! Karin Oberhofer is an Italian biathlete. 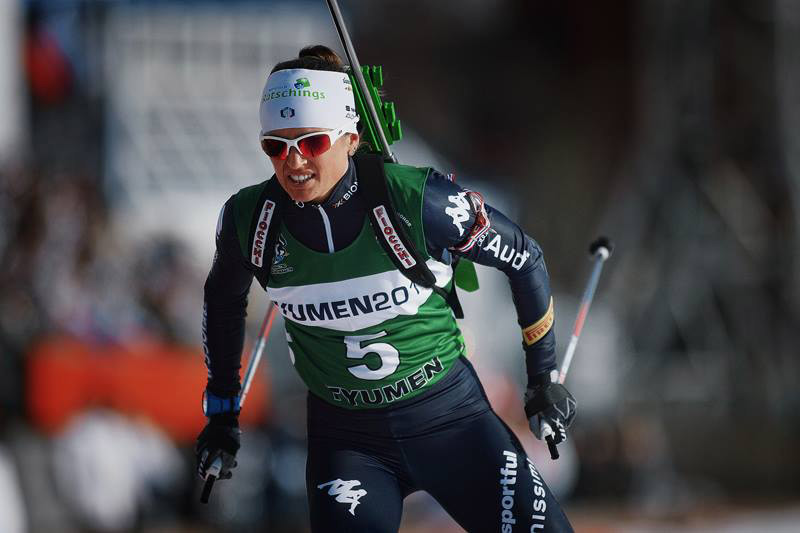 She competes in the Biathlon World Cup. Oberhofer has won a bronze medal at the Biathlon World Championships 2013 (4×6 km relay). She also competed at the 2010 Winter Olympics. Together with Dorothea Wierer, Dominik Windisch and Lukas Hofer she won a bronze medal in the Mixed relay at the 2014 Winter Olympics, in Sochi, Russia. Check out the complete interview with our President, Ms. Namita Nayyar, on Women Fitness. You are a world reknown biathlete having reached the pinnacle of success by competing at the 2010 Winter Olympics and winning a bronze medal in the Mixed relay at the 2014 Winter Olympics. Walk us through this spectacular journey and tell us how it all began? My father was in a wheelchair and took part in Paralympics and World Championships. My parents loved sport. I started to do cross-country skiing and then I decided to start with biathlon very late at the age of 17 when I was at school at the Sportoberschule. I trained very hard always with joy, I never gave up even after difficult moments and my approach is always to improve every year. At the beginning I didn’t think that I would reach so much important results, participate in so many World Cups or win so many medals. I am grateful to have had so many unforgettable moments in Biathlon. To prepare the Olympic Games I have to train very very hard for many years. Every day I have to work on myself, improve my preparation and technique (skiing and shooting technique). Training: 15.00-18.00 training, swimming, walking, cycling etc. In the evening, stretching exercises, video analysis of the training day, yoga, mental training.